The 2015-16 campaign for the Boston Bruins was similar to a roller coaster ride. Some peaks, several decent stretches, and ultimately too many lows. They managed to finish just outside of the playoff picture, but most people envisioned this might happen before the season started. At one point, coach Claude Julien was considered a Jack Adams candidate and then just as swiftly was singled out for the team’s lack of effort and execution. On a grand scale, this past season could be described as nothing short of disappointing. It’s been that kind of year for the Bruins. Now that we are in the dog days of hockey season, I examine Boston’s season to explain the highs, the lows, and the downright ugly displays. Although the Bruins managed to miss the playoffs for a second consecutive season, there were plenty of positives to come out of it. First and foremost would be the play of their top forwards. Patrice Bergeron, Brad Marchand and Loui Eriksson put together impressive campaigns, each scoring over 30 goals last season to become the first Bruins to score 30+ since 2002-03 when Glen Murray (44), Joe Thornton (36) and Mike Knuble (30) did it. Marchand led the team in goals with 37, Bergeron scored 32 and Eriksson recorded 30. Marchand’s breakout season came at the right time as the team gets set to lock down the scrappy left-wing to a long-term extension. Marchand was one of four Bruins to record more than 60 points as he tallied 61 by season’s end. Bergeron led the way with 68, followed by Eriksson at 63 and David Krejci with 63 in 72 games. Overall team offense was a strength for the B’s in 2015-16 since they finished fifth in goals for with 236, averaged 2.88 goals per game and recorded the second most goals of any team on the road. Their power play ranked seventh in the league with a completion rating of 20.5%, including the third best extra-man advantage at home with 22.3%. Scoring first was a key to success since they compiled a record of 32-13-2 when accomplishing that feat. They also managed to win the majority of their games in regulation (38 out of 42), which means that the offense provided more than enough to secure a victory in 60 minutes. In a league that has seen a dip in goals per game and total offense in the last few years, the Bruins certainly showed that a team can still be successful. Their shot counts added to that effect, averaging 32 shots per game (T-2nd) and finishing with 2,620 shots on goal (4th). When on the road, the Bruins posted the 2nd most shots of any team with 1,286. They managed to stay high on the list for goals prior to the All-Star festivities with 144, placing them fourth overall. On the defensive side, the Bruins kept their opponents at bay on the penalty kill with a percentage of 82.2, putting them just outside the top ten. The penalty killing unit provided strength during the stretch before the All-Star Game, ranking fifth with 84.4% and tied for third on the road with 84.7%. They were tied for 11th in shots against with 30.4 and finished with the second-best save percentage on the road with 92%. Five Bruins ranked among the top 100 players in the league in blocked shots. Defenseman John-Michael Liles led the team with 127, while defencemen Kevan Miller, Zdeno Chara, Adam McQuaid and Dennis Seidenberg all blocked 120 or more shots. Their physical presence was felt throughout the league with 2,164 hits (6th), averaging 26.4 hits per game. Off-season acquisition Matt Beleskey led the charge with 260 hits, good enough for eigthth place in the NHL. Kevan Miller (164), Zac Rinaldo (154) and Adam McQuaid (142) all ranked among the top 100 in the hits category. Statistically speaking, the Bruins had a strong year on the individual front and mostly from a team standpoint. Unfortunately, these didn’t translate so well during the final three months when their season was on the line. Before we get to that, however, here are some startling statistics from the entire season. The Bruins ranked 20th in goals against per game with 2.78 and also managed to allow the most goals in the NHL at home with 128. Their save percentage at home ranked 28th with 89.7%, well below the league average. Their penalty killing unit also suffered on home ice, placing them in the bottom third of the league with 79.2%. Boston tied for 17th in goals allowed prior to the All-Star break with 130. The Bruins hung goaltender Tuukka Rask out to dry too many times this season. Between poor decisions in their own zone or the constant pinching into the offensive zone to keep the puck in or make a play, the Bruins allowed a plethora of odd-man chances. As evidenced above, they had a strong shot blocking count but there seemed to be times when the defense looked lost. The result of their defensive woes led to Rask’s worst statistical season of his career. How a goaltender can be third in goals against, shots against and saves and end up 30th in save percentage and 28th in goals against average is beyond me. Offensively, the Bruins suffered at home only producing 109 goals all year-long. This puts them among the lower portion of the NHL. Their struggles on home ice were a huge reason why they failed to claim a spot in the playoff race. They only mustered three wins in games when they fell behind after two periods after compiling a record of 28-4-1 in games when they led after two. They posted a .286 win percentage when their opponent scored first which meant they were towards the bottom of the league. Their three-month stretch following the NHL All-Star Game also didn’t help matters. During that time, they scored 92 goals in 33 games while recorded the third most shots on goal with 1079. The completion percentage ranked among the worst in the league with 8.5% along with their 98 goals against. They were 28th on the power play with 13.1% and 22nd in penalty killing with 78.6%. The Bruins inability to come up big during the most important time of the season proves that while a team can put up some impressive stats, that doesn’t mean anything when a playoff spot is on the line. "We failed on numerous occasions when there were big games." – Claude Julien on assessing this past season. Don Sweeney’s first season as general manager didn’t go exactly as he had planned. He got rid of Dougie Hamilton, Milan Lucic and Reilly Smith in an effort to shake things up within the organization while bringing in Matt Beleskey, Jimmy Hayes and Zac Rinaldo. His goal was to toughen up the team after they had been pushed around too much during the 2014-15 campaign. A tremendous amount of pressure was placed on Beleskey, in particular, to live up to the departure of fan favorite Lucic. He had a decent season, putting up 15 goals and 37 points but managed to prove his worth physically. Hayes and Rinaldo, on the other hand, struggled for most of the season. Hayes is a hometown kid and the Bruins were hoping he would appeal to the fan base. His inconsistent play led to multiple healthy scratches and his team worst -12 plus/minus rating. He spent most of his time on the third or fourth line, which for a player who is touted as a power forward in the making, does not bode well for his offensive opportunities. Given how dominant Reilly Smith was during the playoffs for the Panthers and Hayes’ contract, the Bruins might be regretting that trade. Zac Rinaldo has always been a wild card and a reckless player. The Bruins traded a third round pick for his services and considering how little he provided for his team, they really want that pick back. He was suspended not once, but twice, for illegal hits to the head at the NHL and AHL level following his demotion. He was suspended five games for his hit on Cedric Paquette in February. Ironically after his first game at the AHL level, he was suspended indefinitely by the league for a similar incident. While the second hit wasn’t bad enough to warrant a suspension, it is obvious that Rinaldo doesn’t help his teams out either. He’s been suspended five times now and is essentially a liability for his team every time he steps out on the ice. Wonder if he will get any ice time with Boston this year. Coming off of that, the Bruins ended up with the distinction of being the fifth most penalized team in the NHL with 933 minutes behind the Philadelphia Flyers, Columbus Blue Jackets, Arizona Coyotes and first-place Anaheim Ducks. Rinaldo and Brad Marchand were suspended by the league last season and finished up with 83 and 90 penalty minutes respectively. Boston struggled on the penalty kill for large portions of the season so the long parade to the box each night was always harmful to the team’s chances of winning. Now we get to the ugly stuff. The disappointing 2016 Winter Classic is as best a place to start as any. Considered one of the most embarrassing displays on a national stage, the Bruins were hammered by their biggest rival 5-1 at Gillette Stadium. Montreal got out to an early lead and never looked back. The Bruins were outshot by Montreal 14-3 in the first period, giving their opponent the upper hand to start. Paul Byron scored two goals for the first time in his career and Montreal forwards Max Pacioretty, Brendan Gallagher and Tomas Plekanec recorded multiple-point performances. Massachusetts native Mike Condon led Montreal to victory with 27 saves. It was apparent that the Bruins didn’t show up for this game. The NHL hyped this matchup to be one of the all-time greatest Winter Classics but instead ended up being the most lopsided in history. Sure, they didn’t have David Krejci or Brad Marchand in the lineup but that’s no excuse to flop on the big stage, especially against your greatest rival and with a chance to gain control of the division lead. The only players who showed much of anything that day were Matt Beleskey, who scored the team’s only goal, and Tuukka Rask, who had to deal with a serious barrage of chances all game long. A slew of quotes came in after the game from members of the team, including ones like, “We didn’t represent Bruins or the city of Boston very well today,” from Torey Krug and “We obviously didn’t deserve to win,” from coach Claude Julien. As embarrassed as they might have been, this game became the starting point of the team’s tragic downfall. Being humiliated on the big stage could have been a momentary issue, but instead, it became the catalyst to the Bruins’ woes for the rest of the season. Don Sweeney’s handling of the trade deadline was also pretty ugly. 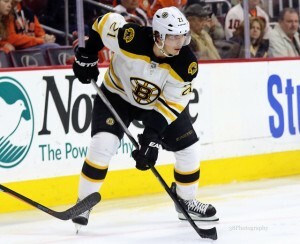 Rumors swirled around soon to be free agent Loui Eriksson for most of the season but it got worse as the team faced off against Tampa a day before the deadline. Most Bruins fans believed this would be Eriksson’s last game. Instead, Sweeney chose to keep Eriksson so that the team could push for a playoff position. They were a team on the bubble and could have used a strong return to shape their lineup for the playoffs. He traded multiple draft picks for forward Lee Stempniak and John-Michael Liles to provide offense and veteran support. Stempniak was a surprise story as he made the New Jersey Devils on a tryout basis and managed to put together a solid season with 16 goals and 41 points in 63 games, his highest totals since 2006-07. Giving up two solid draft picks for Stempniak looked worthwhile but he only mustered up three goals in 19 games when the Bruins really needed more depth scoring. He moved around the lineup a lot while they looked for the right fit. He wasn’t consistent enough and ultimately signed a contract this off-season with the Carolina Hurricanes. Liles came in to help the Bruins out defensively but to also give them a spark that they lacked for most of the season from the blue line. In 17 games with Boston, Liles contributed six assists and registered a minus-seven. He was given a contract this off-season by Don Sweeney but you have to wonder if Liles will be a factor with this team moving forward. The final game of the Bruins season was a must win. Going into a matchup with the Ottawa Senators, the Bruins had dropped eight of their last 11 games and desperately needed a victory. They also needed the Detroit Red Wings to lose so they could slip into a playoff spot. The end result was one of the team’s worst performances in a 6-1 rout by Ottawa. They allowed four goals in a ten-minute span during the second period and were without the services of goalie Tuukka Rask at the most crucial point of their season. 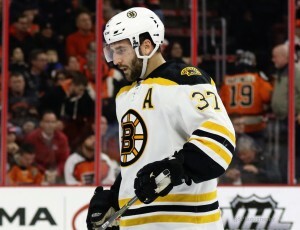 Tempers flared as assistant captain Patrice Bergeron berated his teammates in an effort to get them back into the game. It was all for nothing with the Senators manhandling the Bruins for the rest of the game. Krug on last season: "The feeling of disappointment hit right in the heart. When you fall like that, it’s a feeling you can’t describe." The black and gold enjoyed some high points, dealt with some tough low points and struggled through some ugly displays this season. For Bruins fans everywhere, there is hope that the team can break the habit and clinch a playoff berth in 2016-17. But the 2015-16 campaign will be remembered for its disappointing end.